Update : Beta 3 released ! The b3 version of redsn0w fixes a problem where re-running redsn0w over an existing jailbreak would cause MobileSubstrate-based apps to stop running until MS was installed again. Now you can re-run the redsn0w jailbreak step without worrying about that (but still remember to de-select the “Install Cydia” option if it’s already installed). 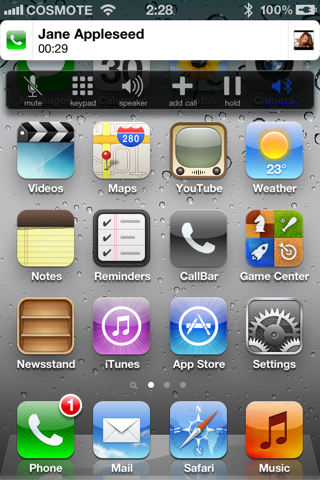 It has been nearly eight weeks since the first declaration by pod2g that he had found a bug that he believed could provide an untethered jailbreak for iOS 5. We find ourselves exactly fifty days down the line, and what I imagine has been a lot of sleepless nights for the developers involved, but we now officially have the release of an untethered jailbreak for all A4 devices running iOS 5.0.1. On December 22nd, pod2g announced via his official blog that would be passing all of his work and details across to the researchers at the Chronic Development Team partly to allow him to concentrate on progressing the development of an A5 jailbreak, and partly because he believed that the Chronic Dev Team could integrate and package all of his work into a distributable jailbreak. It seems that his instincts were correct as only five days after that decision was made, we are seeing a release of a jailbreak for A4 devices on iOS 5.0.1 which has been implemented by both the Chronic Dev and iPhone Dev teams. 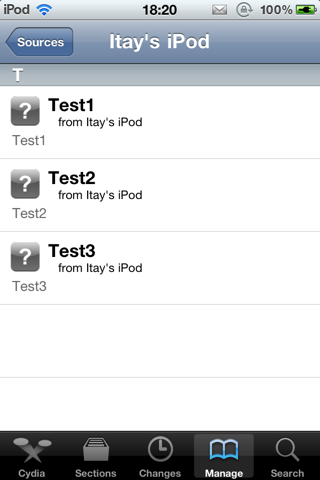 The iOS 5.0.1 untethered jailbreak contains the exact same set of files that pod2g provided to the Chronic Dev Team, and can be distributed as either a download via Cydia by searching for a package named ‘Corona’, for users who are already jailbroken tethered, or through a Redsn0w bundle for users who have running stock iOS and have been waiting for this untether. At the time of writing, it is worth noting that this jailbreak currently only supports iOS 5.0.1 with Chronic Dev Team member p0sixninja tweeting out that 5.0 will follow soon after a number of small bugs have been eradicated and more testing has been carried out. Pod2g has also released some advice to A4 and A5 users advising not to update their devices to iOS 5.0.2 or 5.1 when released as this would cut their chance of a future jailbreak. Note: The jailbreak released is supported on all A4 based (and below) devices like iPhone 4, 3GS, iPod touch 3G/4G and iPad 1. Newer A5-based devices like iPad 2 and iPhone 4S are currently not supported. If you are currently operating an A4 device which has a tethered jailbreak using Redsn0w, Ac1dSn0w or Sn0wbreeze then you can simply launch Cydia from your Springboard and download a package named ‘Corona’ which will provide you with an untethered jailbreak. If your device is running stock iOS 5.0.1 then you can use download the latest Redsn0w 0.9.10b3 to for either Windows or Mac to give yourself an untethered jailbreak, instructions for which can be found below. Step 1: Download the latest version of Redsn0w from the links given above. 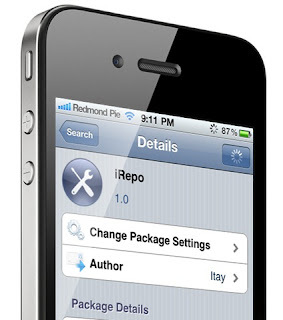 Step 2: Start Redsn0w, select "Jailbreak" then check "Install Cydia". Follow the onscreen steps to place your device into DFU mode. Step 3: Wait for Redsn0w to apply the full untethered jailbreak! Once done, your iPhone, iPad or iPod touch will be rebooted into fully untethered jailbreak mode! For those of you who rely on Ultrasn0w or Gevey SIM unlock must preserve the old baseband using “Custom IPSW” option found in Redsn0w. 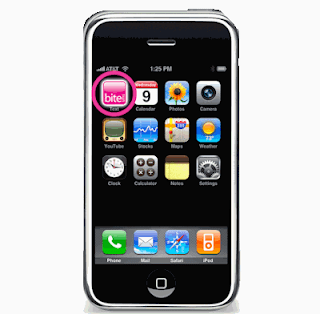 * iOS 5 compatibility, works on iPhone and iPod devices. Fully integrated with all iOS 5 features including iMessaging and Notification Center. * NEW Look Quick Compose and Quick Reply. * NEW Passcode lock feature inside Quick Reply. * NEW Ability to use the native Messages icon instead of the biteSMS one. Note: For iOS 4 users, in effect you are installing Release 5.5 of biteSMS and don't get any new features. Note: For iOS 3 users, in effect you are installing Release 4.8 of biteSMS and don't get any new features. Please uninstall any previous version of biteSMS and respring before installing this!!! - Open Cydia, it will notice you that there's a half installed package (biteSMS). Select to forcibly clear it. You love your iPhone as much as we do? You text all the time? Want more features? Then biteSMS is for you, with lots of extra features like smileys, Quick Reply, Quick Compose/Quick Call, Privacy, a character/SMS counter and much more! You can use biteSMS as a replacement to the built-in Messaging application, and send messages via your mobile carrier as you normally do. Or, if your mobile carrier charges a lot for sending SMS messages (say texting to overseas), you can buy credits and send them via the biteSMS network instead, which can be much cheaper. Update : Version 1.0-5 released ! Crack is out !! - Fixed a proximity sensor issue blanking the screen when at lockscreen. - Added orientation handling for contacts, recents and favorites. - Fixed a bug where a new call would not take place if you had earlier opened the dialer and closed it without making a call. - Fixed appearing order of first-last name according to user's preference. - Added back answer-decline buttons option after users requests, Call Pickup Method is now available in settings. - Added an online usage guide-FAQ in settings. - Better activator method responses. - Removed answer-decline buttons, you now answer by swiping right and decline by swiping left on callbar. - Added tap to show/hide in-call buttons. Tap callbar while in an active call to trigger. - Added tap to open related call application. Tap the application icon on the left. 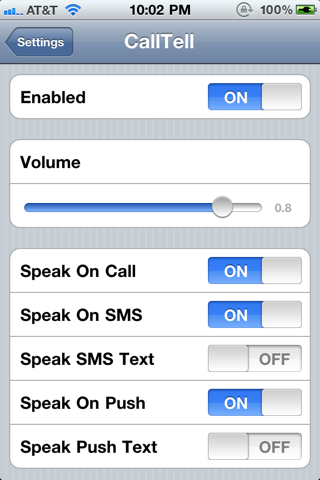 - Added the following call management buttons: Mute , Speaker , Add Call, Keypad , Bluetooth , Hold Call, Swap Calls, Merge Calls. 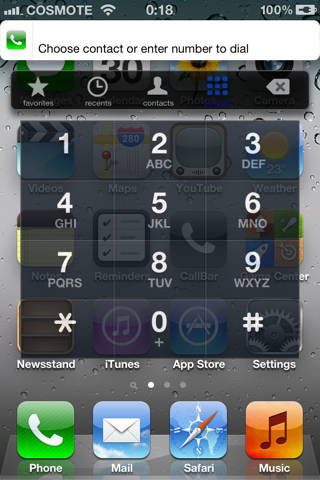 - Callbar is now aware of a second incoming call and allows call-swapping/merging. - The keypad can be used for both sending DTMF tones while in a call or dialing out a number when idle. - Removed methods for ringing applications (Anyring, ToneFXs etc) . We now provide an API for developers for this. - Added application for managing settings. Don't let incoming phone or FaceTime calls interrupt what you're doing on your device any longer. CallBar re-designs the incoming phone and video call interface to allow you to use your device while it's ringing. Choose to answer, decline, or even dismiss the incoming call depending on your choice. Upon dismissal, the bar will shrink and cover the status bar - a safeguard just in case you choose to pick up the call after all or you accidentally dismissed. You can answer or decline the call from this dismiss view also. Dismissing the call silences the ring or vibrate, which is done by tapping the banner, hitting the Power button, or pressing the Volume buttons. To re-enable the ring or vibrate, simply tap the banner to bring the banner back up. All the above functionalities are available from the SpringBoard, within any application, and on the lockscreen. You could be texting, updating Twitter, surfing the web, or in the middle of using any application - CallBar allows you to continue what you are doing without interruption and gives you the option to handle the situation with ease. CallBar User Guide - use it as a tool to help you become familiar with the different gestures, actions, buttons, and settings of CallBar. Update : Version 4.0 released ! Crack is out!!! -Pick your language voice (when Apple adds more) to match your likings. --Silence speaking by the action of your choice. 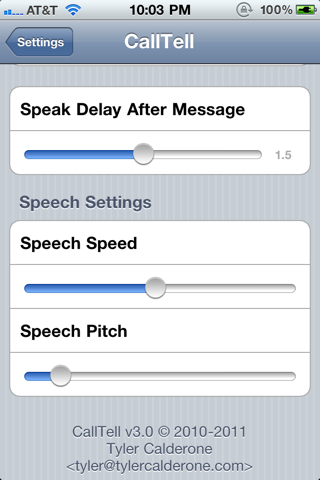 Want a message to stop being read, choose one of Activator's many actions to silence it! -Enable speaking of third-party apps individually! No longer do you have to have EVERY app speak notifications, just pick and choose the one's you'd like! -Redesigned interface for iOS 5! CallTell is the next advancement in iPhone communications. Find out who's calling you BEFORE looking at your phone! CallTell announces who's calling you before ringing. It also works for text messages! You can even have CallTell read the text message out loud as well. 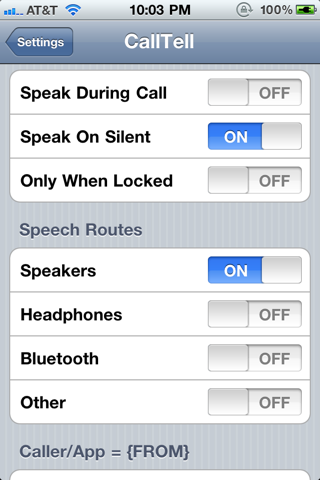 You can enable/disable certain features via the CallTell page, in the Settings app. This add-on will not create any new icons on your homescreen. It can be configured from Setting app. CallTell is a simple but cool tweak available in cydia that names out who is calling you. So for example you get a call and before ringing like normal the iphone uses its voice control feature to name out whos calling first. 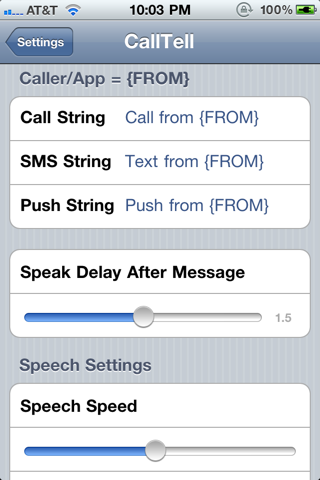 CallTell only works on the iPhone 3gs and iPhone 4 since voice control is required. My personal experience with this cool tweak is 50/50. The name calling out loud before a call works well but its not loud at all so that defeats the purpose as you can barely hear the name before it starts your normal ringtone. The text messaging also isn’t loud so again it defeats the purpose along with not being compatible with bitesms or other 3rd party text messaging apps. I couldn’t get the message reading to work until i disabled my 3rd party bitesms app and went back to using the regular stock messaging Apple app. Overall CallTell is a good tweak but needs some work and compatability added to it before it gets an A in my book. You can purchase it for $1.99 in cydia. Please note there is a bug with the settings page ( no extra settings for this ) this will be resolved upon next update, other than that it does work, install then try calling yourself , you will here it say whos calling ( call from ..... ) then start ringing! Update : Version 1.3.1-1 released ! Crack is out !! Have you ever wanted to create your own repo but you didn't know how? Or have you ever wanted to share a package to a friend but it was too big to send by email? So, this is for you, with iRepo, you don't need any knowledge about repos, packages or anything, just upload the packages downloaded from PC to your Device with this user-friendly interface and host it by your own.